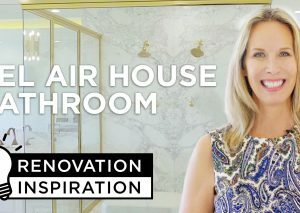 From me, Lori Dennis, and the other Lamps Plus brand influencers, here are the best ways to light your bathroom: We’re keeping it functional, fabulous and on trend with these quick tips! Side lighting is imperative in the bathroom. The goal is to fully illuminate your face. To do that you’ll want about 75 watts of incandescent lighting on either side of the face so as to eliminate any shadows. Find sconces you like! With a centered vanity mirror, you’ll want to mount sconces just inches on either side where the bottom of the bulb or shade should rest right above eye level. In a design in which your mirror spans the entire wall, work with your designer or contractor to mount lighting directly on the mirror. Say OM! How zen is this modern bathroom? This is going to be the light that floods the space. This amount of overhead lighting is imperative for functionality. While the side lighting helps to eliminate shadows, the overhead lighting is going to flood the entire space. 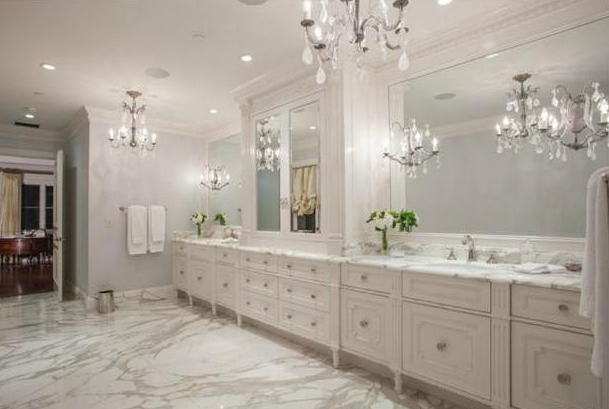 We’re seeing lots of modern horizontal bars with multiple lights, above the vanity mirror. Your large scale light fixture should provide about of 150 watts of incandescent light. Unless you are deliberately going for the canopy look in which light shades dip down over the mirror (which can be beautiful and bounce light around the space), this fixture should comfortably clear the top of the mirror. Is there a room a chandelier shouldn’t go in? We don’t think so! 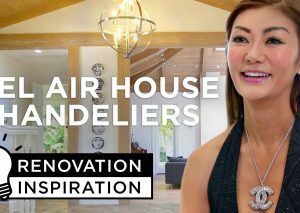 Whatever the style of the space, there is a chandelier or pendant to match! 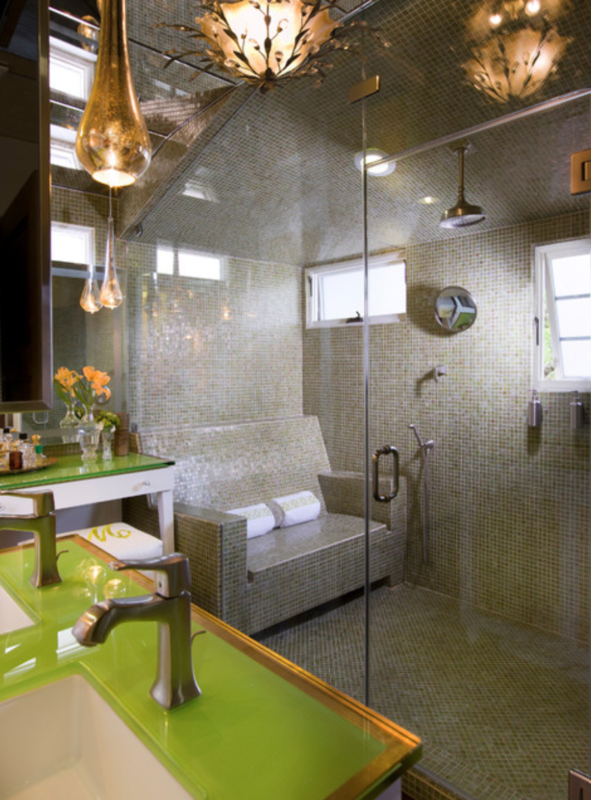 Bring in some bling with a chandelier over the bathtub or in the center of the space. 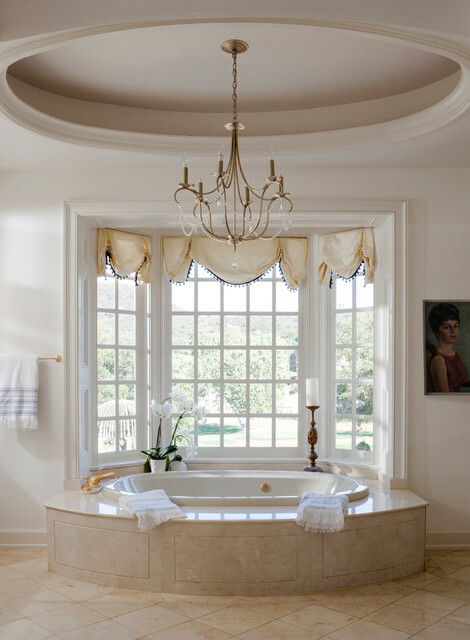 But the size of the feature is so important — if a chandelier is going to feel too low in too small a space, or may create a code issue by hanging too close to a bathtub, a flush mount is an excellent alternative. Fixtures should be 3 feet or more from the tub, and this is a fixture you’ll want on a dimmer switch separate from the rest of the lights. Speaking of dimmers… Let’s give that some greater thought. The more control, the better! Keep each light source controllable separately, and on a dimmer. You’ll want softer, dimmer lighting (by about 20%) you can use later at night compared to the flood lighting you’ll want during the day or when getting ready to go out. 6 More is More: Light in Layers! Ambient lighting: This is your base layer. Forget about vanity and shadows for a second. This is going to be your primary light source for which safety is the priority. To get that modern, hotel bathroom lighting, consider fluorescent or LED light strips around cabinets or built into flooring/walls which will give you a soft, night light glow with enough lighting to safely move about the space. Accent lighting: This is where you start to think about the aesthetics first! Accent lighting is there to highlight your gorgeous tilework, art, or a sculptural sink, for example. Task lighting: This one is pretty self explanatory: Task lighting spotlights specific activities taking place – for the shower, for shaving, etc. While we like mixing and matching finishes — that’s very in right now and gives a space a lived-in, but designer touch, the bath is such a small, tight space, it is generally best to match sconces to overhead features, or at least keep them all in a similar finish. Brass and chrome tend to be the most versatile and easiest to mix and match with other design elements and accessories. All this talk about lighting fixtures, but what you’re absolutely going to want to do is be sure to maximize your natural light. If you’re building a new home or adding on a bathroom, it’s best to build your bathroom so that it’s facing north where you’ll get the softest illumination. This is ideal for getting ready in the mornings as the natural daylight is going to be optimal for setting your circadian rhythms. If you have the ability to add windows, consider installing them on adjacent walls to balance out your natural light exposure. When it comes to window treatments in the bath, we suggest staying away from heavier materials or dark colors– you want to stick with sheers or bottom up shades that will provide privacy but still let the sunshine in! We’ve touched on this a little bit already. Choosing the right bulbs is imperative both for safety and to get the lighting just right. We’d suggest both the warmest and brightest lighting you can get, 2700K LEDs, 150 watts, for example to resemble natural daylighting. 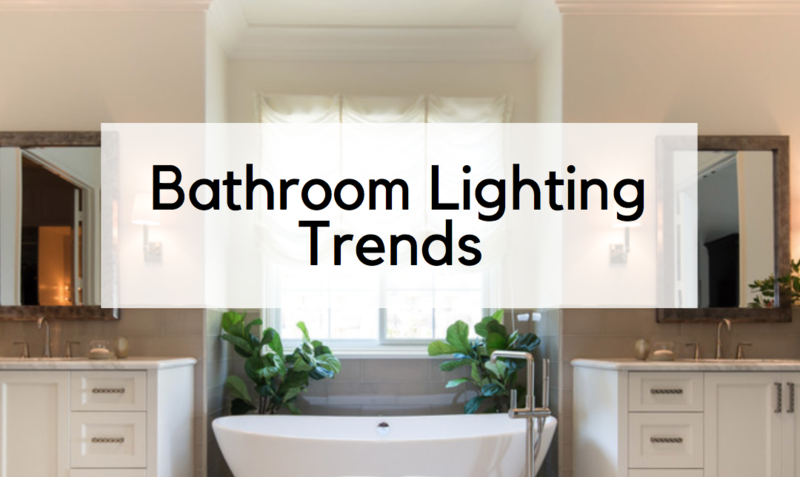 Because a bathroom is one of the only spaces you use at multiple times throughout the day, it needs both sharp, bright lighting and softer romantic lighting (all on dimmers!). 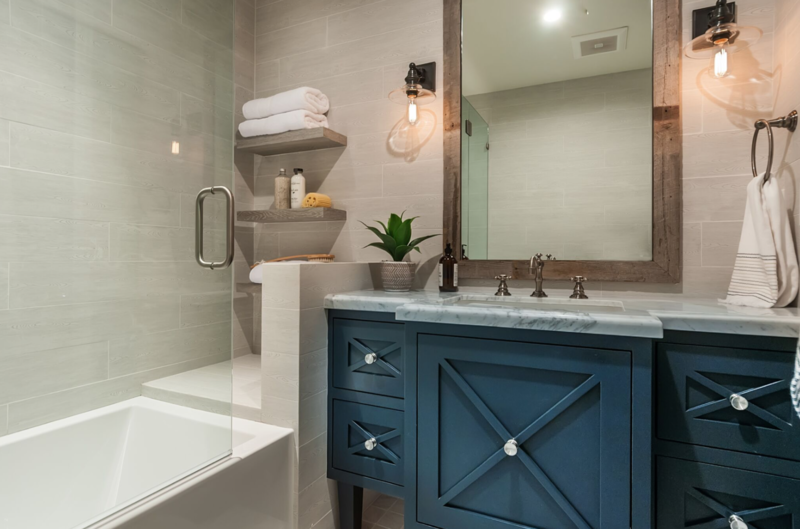 Traditionally, we’d suggest avoiding glass or fabric shades and exposed bulbs in the bath because it hinders the distribution of the light, but with the emergence of trends like the modern farmhouse and industrial modern style, that advice is outdated. 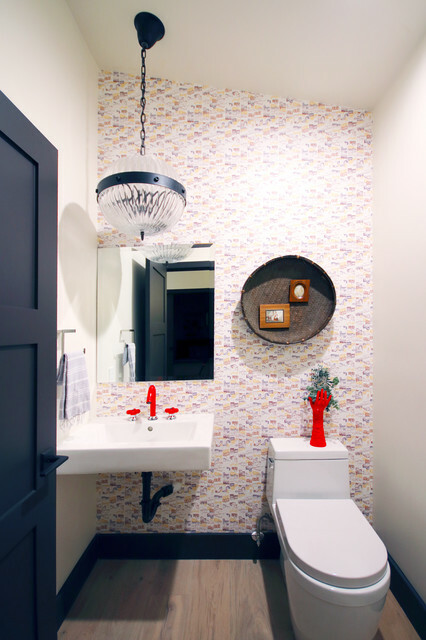 With that said, fixtures with white, diffused shades are going to give you the best lighting distribution that’s often so important and sought after for a bathroom design. Why are hotel bathrooms always the best? High-end hotels often feature LED tape lighting around a vanity or a countertop edges or in showers or on the floor, and provide ample electrical outlets behind sinks and toilets. They really think of everything!